My professional focus is on product innovation and software development for scientific and industrial applications. I enjoy working concurrently with scientists, engineers, customers and partners to synthesize effective solutions. On the technology front, I have hands-on experience with coding, mathematical modeling, user interaction design, image processing, color sensors and instrumentation. I have also worked on business planning, innovation management and marketing. My graduate work was at the University of Washington and undergraduate at Indian Institute of Technology, Roorkee. Currently, I am a partner at indriya.io (my product development company). Previously I have been VP of Marketing, Director of New Business Development, Program Manager, Technology Manager, R&D Engineer and Post Doctoral Researcher at companies big and small. Growth hacking is a lot of work. You want efficient execution. You don’t want to have to wait for inspiration to strike. You need to get cracking. The boss wants to see more leads in the pipeline ! Here is a simple framework that might help you get cracking with the growth hacking. Using this framework to plan marketing actions has helped us be more efficient with marketing execution. Maybe it will do the same for you. That’s where the 3Cs come from. Once you have these lists, the idea is to connect each item on List 1 with the appropriate items in Lists 2 and 3. We will show an example to illustrate this point. A systematic way of thinking about deploying each piece of creative content to maximize market reach equals more miles per gallon. This entry was posted in marketing and tagged marketing on May 2, 2016 by Niraj Agarwal. I just released a new web research tool http://research.run that you may find useful. Take a look. Let us know what you think. This entry was posted in Uncategorized on February 2, 2013 by Niraj Agarwal. Stage-gate is a common product development process. When projects become troubled or products fail, the process often gets questioned. Here is a compilation of best practices to consider in your stage-gate implementation. 1. Define products based on market needs analysis. Value creation is critically dependent on addressing key unmet market needs. Product definition driven by market needs is safer than one driven by technical ideas. In addition to surveys and interviews, end-user observation in their work environment can produce insights that become essential to successful product definition. 2. Engage cross-functional teams. A successful product development requires input from many perspectives. Modulated inputs from sales, service, support, manufacturing early in the process keep the project team from being blindsided. The process is one of the natural tension involved in trade-offs. Here, an environment of authentic dialogue among team members leads to creative problem solving that adds value. 3. Operate a funnel, not tunnel. Projects are hard to kill but easy to wound. We tend to be hopeful of a good outcome by prolonging a troubled project. We also worry about hurting people’s feelings by killing “their” project. Bandwidth get’s consumed as a project churns all the way to the bitter end. 4. Approve projects only if resources are available. A “go” decision at a gate is empty if resources are not really available. Overloading the resources results in gridlock – slows everything down and eventually results in lost productivity. Mental switching costs are high when developers are multi-tasking on more than 2 projects. 5. Standardize project review templates. A large volume of information can hide facts that are critical for decision making. Using a template that makes key information clear is vital for good decision making. Product cost, performance, remaining risk factors, functions not yet implemented, user/market feedback should always be clearly presented. 6. Avoid executive pet projects. On the one hand, the forcefulness of an executive champion can help move mountains. On the other hand, pet projects that run outside of process and develop a life of their own can become difficult to contend with at the end. These are often projects that bypass the gates and cannot be killed. 7. Scheduling and decision making. Plan ahead to schedule dates for gate reviews but not so far ahead that the team cannot hold to the date. Moving the gate review dates around can be cause for much consternation. For the process to be meaningful, always make a go/kill/recycle decision at the gate. 8. Limit gate review participation. Good execution of a project may require input and involvement from a large number of people. This should be done during the project stages. At the gate review itself, the participation can be limited to the project’s core team and gatekeepers (the ones who own the resources). A smaller review team avoids unnecessary and unhealthy confusion. 9. Use transparent criteria for decisions. After the presentation and Q&A at the gate review, decisions can be highly subjective. Using a scorecard that allows multiple gatekeepers to rate a project on multiple criteria can be a good way to achieve some objectivity to justify a decision to the team. 10. Conduct portfolio reviews. That attractiveness of a project can only really be gauged in relation to other projects in the pipeline. Since the problem is one of resource allocation, it helps to periodically consider the portfolio as a whole for optimal allocation. This entry was posted in product development on May 29, 2012 by Niraj Agarwal. Create visceral and personal experiences. This gives you food for thought and a new perspective. e.g. go see your competitors store, visit a customer in their work environment, order your own product, call your own customer service. Bring the execs along if you can. Pretend to be someone else. This also gives you a new perspective. e.g. Ask – What would Apple do ? Or Southwest, or Google, or Disney, or a kid, or a startup. Impose a big new constraint. This also gives you a new perspective that can spark ideas. e.g. you can only sell the product online, one hand is tied behind your back etc. Perceiving a reality that is new to you is the essential precursor to creating a solution that is new to you. To get a new idea, get a new perspective. This entry was posted in Uncategorized on April 14, 2011 by Niraj Agarwal. Interesting brief from McKinsey on B2B sales. While customers claim that price drives decisions, their real behavior is different. When customer’s get value through the sales process that experience becomes the driver for choosing your product. Manage customer contact frequency. Strive/plan to deliver high value at each customer contact. Don’t waste their time. Consider a scheduled biannual business review to go over needs and issues. Improve product/application knowledge. Centralize content development to have a clear, consistent message for value proposition. Get hands on experience with your product and competitors product. Delivering value is the key both for success in the sales process as well as success in new product development. This entry was posted in Uncategorized on May 12, 2010 by Niraj Agarwal. 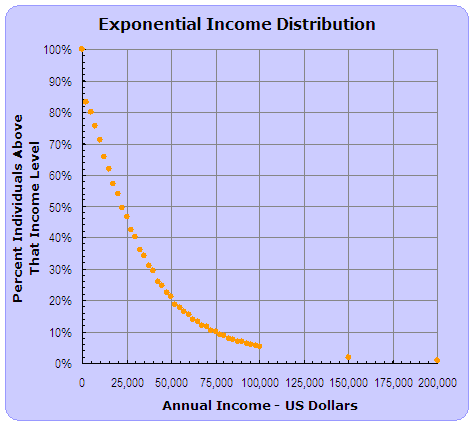 What would the market size be if we targeted individuals above $100k of annual income ? We see that the answer is ~ 5.5% of income earning individuals which turns out to be about 12 million folks. It is interesting to note how quickly the market size drops off if the product is designed and priced to target higher income levels. Knowing the mean income (~$32k) you can calculate the fraction of people with income above any level with the above formula. Interestingly, the exponential distribution is also used for predicting failure rates of light bulbs and electronic components. How many bulbs will glow for say 100,000 hours can be calculated simply from the average life of a bulb. POLICY IMPLICATION : This makes me wonder if fiscal and tax policies that favor the middle class or favor the rich may be exactly equivalent. The whole income distribution curve moves in a related way. In other words, if the mean income goes up, the number of millionaires goes up correspondingly. More millionaires will also result in an exactly corresponding increase in mean income. Think about it. This entry was posted in Uncategorized on July 9, 2009 by Niraj Agarwal. The fundamental need is one for greater efficiency. actually end up creating value in practice. the needle in a meaningful way for an innovation economy. for the practice of innovation? steps can determine the course of a project. can be captured in three factors. things to have in your toolkit. Product flops are painful…and too common. New product success rates range from 10% to 50% depending on the market segment. As a development team, we set out to build a superior product. We are creative and keen to design features we believe are likely to deliver customer benefits. However, profits are hit-or-miss. Improving innovation efficiency can pay big dividends. To succeed at innovation, companies must ensure that the ideas they choose to implement will actually end up creating value in practice. The initial steps often set the course for a project. A solid front-end process is a critical success factor. 1) Be thorough in understanding real user needs. Break down user activity into stages so that you can look at ways to improve efficiency in each stage. Speak with users in their work environment. Grasping the user’s yardstick of value is key. Matching product features to areas of strongest unmet needs gives greatest value creation. Our tendency is to shape a product around our own initial presumptions of user needs. Get good information first, then develop ideas. 2) Take the time to create a detailed functional description of the product. This allows you to think through the different aspects of a product before investing any development dollars. Discuss this with customers as a validation and use the functional specification as a basis for building technical specifications. Build software wireframes and 3D renderings for hardware if possible. This helps reduce project delays and frustration caused by feature creep. 3) Build over time a trustworthy system for value estimation of a product concept. Forecasting may be inexact but is necessary for investment decisions. Calibrate your financial model against appropriate benchmarks like the history of a similar product in your company. NPV calculation and the Bass Diffusion model are two useful things to have in your toolkit. Here are links to 3 articles that I found useful. Turn Customer Input into Innovation (PDF) : The ideas here are proven and make a solid case for taking a detailed approach. Bass Diffusion Model (Wikipedia): Reputed to be the most popular model in the field of marketing. Lots of paper on this topic if you search Google Scholar. Success Factors in Product Innovation (PDF) : Another great article to tap into the wisdom of an experienced practitioner and researcher. This entry was posted in Uncategorized and tagged forecasting, fuzzy front-end, innovation, marketing, planning on May 31, 2009 by Niraj Agarwal.